best of: Blitz - one year anniversary celebration! Um, you might want to take a nap Thursday afternoon if possible because there's a lot happening on Capitol Hill. 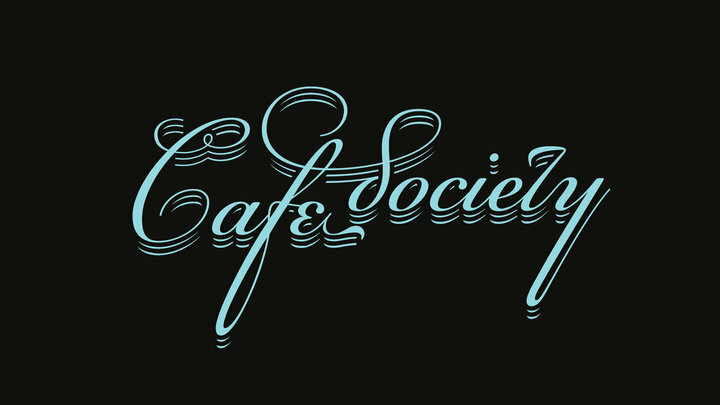 Hopefully you've already heard about Cafe Society. 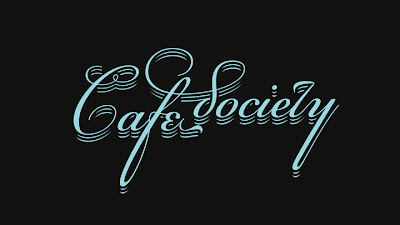 Started by the amazing Jennifer Peterson and Sarah Walczyk, Cafe Society takes its name from the first integrated jazz club in the United States. The NYC club also happened to be the first place Billie Holiday performed Strange Fruit, one of the most powerful songs this world has ever heard. "Seattle’s Café Society will celebrate the renaissance happening in this city’s music scene as of late by hosting a monthly party at a rotating venue that will showcase a female artist representing her genre of music, which will be followed by a DJ who will create the perfect atmosphere for a dance party." Swing by Moe Bar from 7-9 to prefunc with the ladies before heading over to Neumos where the music starts at 8pm. More details here. 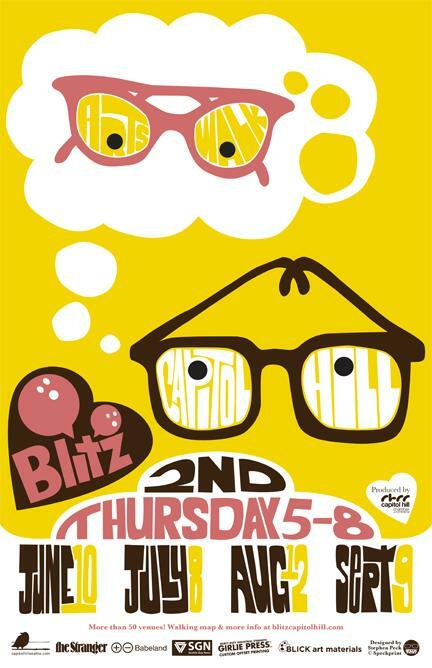 The biggest party on the hill this Thursday is going to be the 1st anniversary celebration of Blitz (Capitol Hill's art walk). There will be all sorts of fun events happening all over Capitol Hill. Because the hill's art venues are a bit more spread out, they're trying to make it easier for you and have created different mustache tours led by folks such as Ellen Forney, Jean Du Jour and Audrey McManus. Have kids? Bring them on the specially designed Kids Tour. There really is something for everyone. Don't miss the preview of Sound Transit's Wall Project (led by D.K. Pan). More details here. 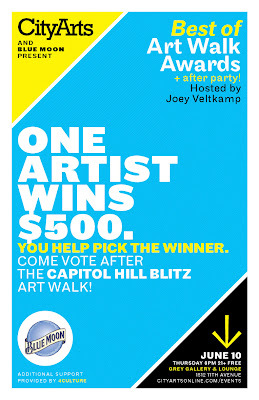 City Arts moved our Art Walk Award/After Party up to the hill for this month to celebrate with Blitz. The 3rd installment will be at Grey Gallery & Lounge. If you haven't already heard the sad news, Grey Gallery will closing for a while to find a new location. We've only got until June 19 to enjoy Grey in its current location, so swing by for the after party and check out Robert Hardgrave's amazing art! If you're not already familiar with the Art Walk Awards, me and 2 guest judges walk around and each select our favorite. 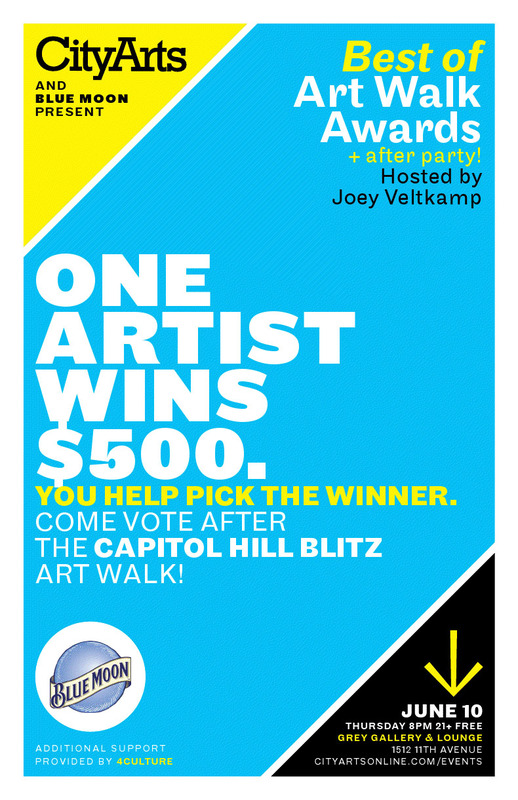 Then we rendezvous back at Grey and YOU (the audience) votes on your favorite piece and that artist wins $500! And there's also a $50 drawing contest. The party officially starts at 8:30. More details here. 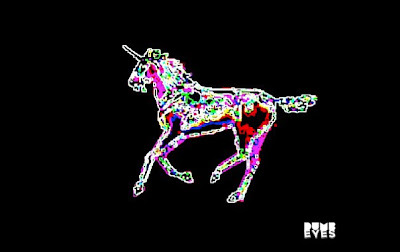 And after the party, swing by the after-after party at Unicorn. Dumb Eyes presents their 'psychedelic freakout' PENETRATION - a trippy extravaganza of audio and visuals. Prism glasses are provided. I can't wait for this!! Artist Amanda Manitach documented some of the craziness here. *bounce bounce bounce* This will be a fun week! Also, I did not know about Cafe Society. Sounds fun! I know - I'm exhuasted already and it's barely Monday. Did you meet Jennifer (of Cafe Society) - she's a huge New Guard supporter and was at your Xmas dinner one. For sure you have to meet her!